Even in the heat of August and in the midst of drought, a walk along the diminishing creek shares secret glories. This week, here in the Texas hill country, I saw ordinary little miracles. A green kingfisher winged above the creek at my eye-level as I stood on the bank. 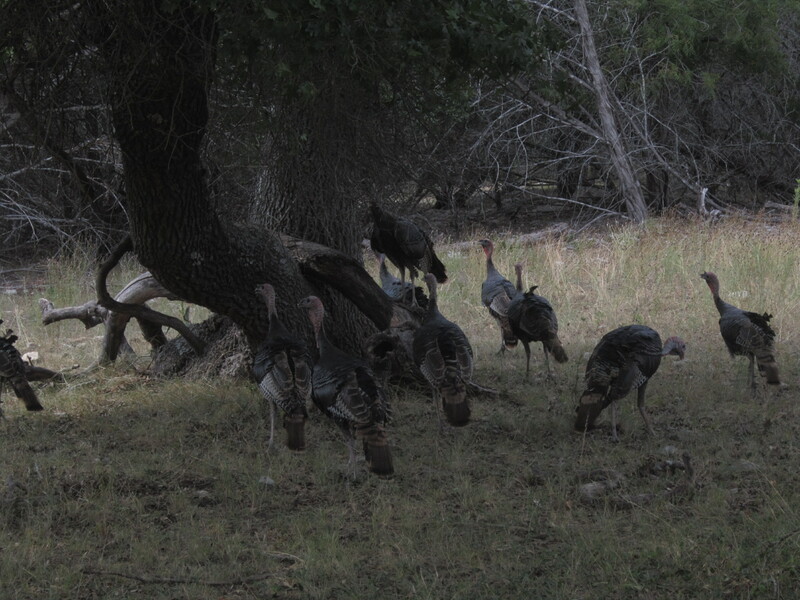 Turkey gobblers lolled in the shade of an oak. A yearling vermilion flycatcher stopped to collect an insect on a milkweed plant. Trees seemed to be focusing on reproduction in this driest part of summer. Pecans held clusters which will ripen in October. 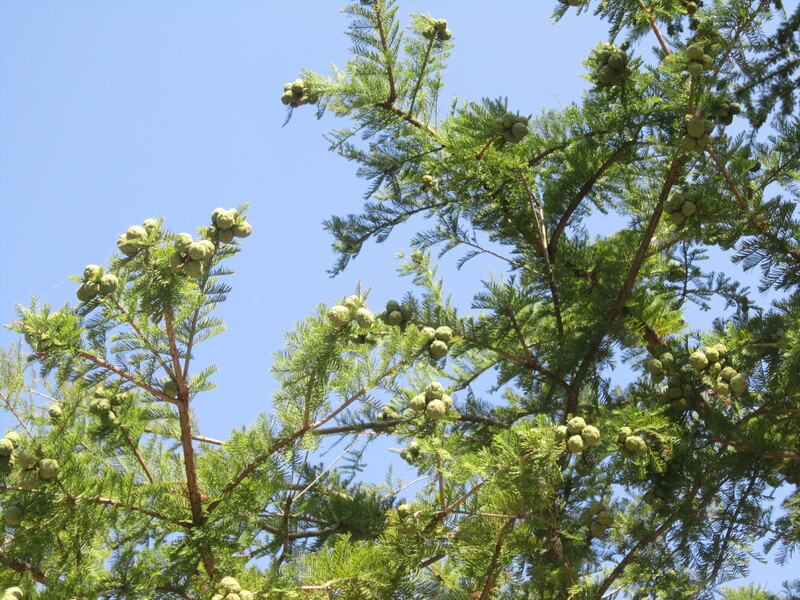 Bald cypress branches displayed an exceptional number of green conelets whose scales will release seeds this fall. The escarpment cherry trees along the trail appeared wilted, leaves folded in an effort to hold on to moisture, and they had already dropped their tiny cherries on the ground underneath. As close friends and family dealt with sobering difficulties this week, and news media featured details of chemical warfare and dying dolphins, I gained a respite on my walk. Somehow, nature goes on about its business, carrying forward, feeding our spirits. What gives you respite from worries? Describe ways in which nature seems to carry on its business. 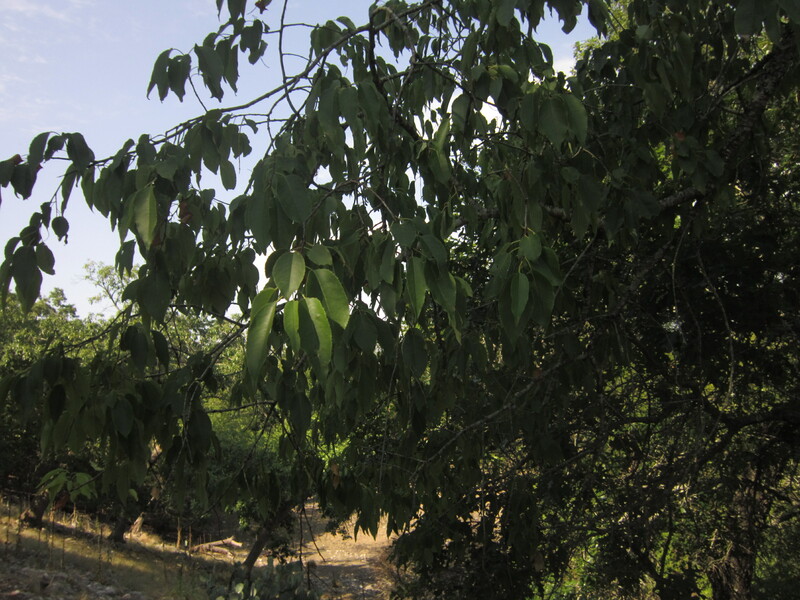 This entry was posted in awareness, birds, hope, landscape, ordinary miracles, secret glories, Texas hill country, trees. Bookmark the permalink. I find respite when I shut my eyes and concentrate on the feeling of the wind on my skin, and when I look down at the way the sunlight shines on my hands. I like the idea of secret glories. That’s good imagery. You use lovely phrasing in describing how paying attention to our senses can give us an interlude of peace. Huck, I love it that you’re writing at http://josephhuckobey.wordpress.com/2013/07/15/the-view-at-the-end/! Thank you for reading this and for responding. I borrowed “secret glories” from poet E. E. Cummings, as I explained in an early post called Wonder As Prism. I want to be like that, also, Linda. Hopkins’ poetry often touches me. Thank you for sharing this poem and its powerful message. Blessings, friend. Chris, I enjoy your writings so much each week! Your observations and memories have sparked so many of my own from our childhood! Thank you for giving us the ‘spark’ into the past and ‘insight’ to slow down and observe our present! Thank you, Cathy. Your comments mean so much to me–you’ve made my day. You are on my mind, and I wish you rich blessings as you heal, and that is what I envision for you. Thank you–I did a quick visit to your blog and love your photos and humor as well.